Galifianakis is an interesting choice to play David because he portrays the real life bank robber as a somewhat naïve, goofy guy and yet the real David doesn’t seem to be that way at all. They say truth is stranger than fiction. And sometimes it can even be entertaining. Such is the case with Twentieth Century Fox Home Entertainment's movie, Masterminds. Based on a true story, the film gives a slightly humorous slant to one of the biggest bank heists in American history. Available now on Blu-ray and DVD, it depicts the story somewhat honestly, while certainly taking poetic license. David Ghantt (Zack Galifianakis; The Hangover) works for Loomis Fargo as an armored car driver and is engaged to a woman he clearly doesn't love. When his former coworker Kelly (Kristen Wiig; Bridesmaids), who he secretly has a crush on, contacts him, David is eager to meet her. However, once he arrives he is drawn into a plot by Kelly's friend, Steve Chamber (Owen Wilson; Wedding Crashers), to rob the bank. Things start to go south almost from the beginning when David, who has fled to Mexico, realizes Kelly isn't coming to join him and Steve is cutting him out of his share of the money. David also finds he is the target of a hit man sent by Steve to take him out. Eventually, David comes back to the United States, unwittingly gets Steve to confess his crimes to the FBI and ends up in jail for seven years for his part in the heist. Galifianakis is an interesting choice to play David because he portrays the real life bank robber as a somewhat naïve, goofy guy and yet the real David doesn't seem to be that way at all. I suppose the casting is accurate though because the film has a sense of what I like to call "stupid funny". Wiig was enjoyable as Kelly and Wilson does a good job as the evil, conniving Chambers. Smaller roles portrayed by Kate McKinnon (Ghostbusters), Leslie Jones (Ghostbusters) and Jason Sudeikis (Horrible Bosses) were well done and helped to make the film mildly funnier. However, with several former Saturday Night Live actors and executive produced by Lorne Michaels, one would tend to the think the film would have been hysterical, which, unfortunately, it is not. The plot becomes more interesting once you find out that it was loosely based on real life events. However, other than the occasional laugh, the movie isn't all that funny, which is a waste of so much comedic talent. The dialogue is uninteresting and cheesy, which is unfortunate. The Blu-ray is the standard 1080p high definition video with a 1.78:1 aspect ratio. The picture quality is terrific and the colors span a range of hues that are vibrant and appealing. The audio is DTS-HD Master 5.1 and is clear and crisp. There isn't anything very unique or special about the audio, but it does the job. The Blu-ray only offers one extra besides the theatrical trailer and sneak peeks at other films in the same genre. Frankly, the sixteen-minute long feature entitled The Imperfect Crime is the most interesting part of the disc. It reviews the real life heist with interviews from the FBI agents who worked the case and with the real David Ghantt himself. I found the mini documentary fascinating and wished it had been longer. The movie is, sadly, boring and stupid and except for cracking a smile once or twice, I didn't find it funny at all. Both Galifiankis and Wilson annoy me so I was prejudice from the get go and neither did anything to change my opinion. The ladies were good for the most part, but they couldn't carry the film by themselves and, let's face it, the last time they tried with the Ghostbusters remake, they weren't very successful then either. There wasn't much that was redeeming about this movie and the Blu-ray doesn't offer enough, including no digital download, to make it worth the purchase price. Download Masterminds from the iTunes Store in Digial HD. 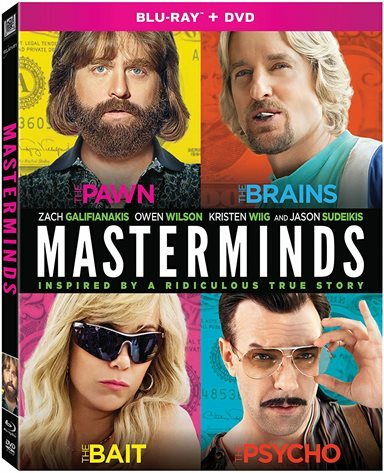 For more information about Masterminds visit the FlickDirect Movie Database.